Looking to find the top memory foam pillows? If you’re looking for form-fitting, shape-to-you comfort, then a memory foam pillow could be just what you need. 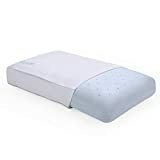 Many memory foam pillows also feature gel cooling or integral ventilation, which can make the crucial difference between a good night’s sleep, and hours spent tossing and turning, for those who live in states where the night time temperature can be uncomfortably warm. Because they shape to your sleeping position, memory foam pillows offer greater support than traditional pillows. However, they are not posture pillows, and are not designed to help resolve neck or back issues. It is worth paying attention to any recommendations for specific sleep positions – the kind of pillow that performs well for those who sleep on their side may not suit someone who sleeps on their stomach, for example. Because they mould to your predominant sleeping position – which may not be the one you start out in – memory foam pillows often need to be firmly plumped up each morning, so that they are comfortable when you first get into bed. Also, because of the manufacturing process of memory foam, and especially if the pillow you choose features gel cooling, there will often be a chemical smell attached to a new pillow. This will usually disperse by leaving the pillow exposed to sunlight for a day or two. 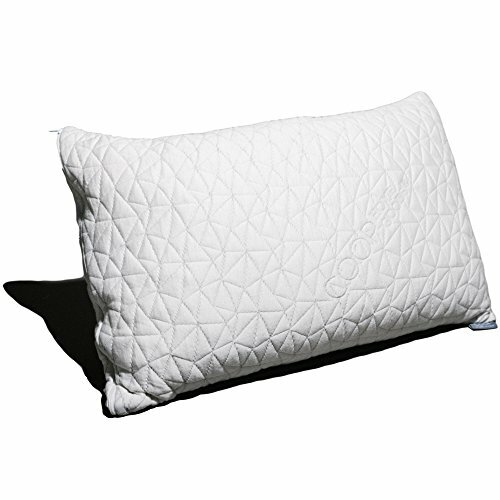 Made in the USA, from non-toxic material, this pillow is hypoallergenic and anti-microbial. It offers orthopaedic support, helping to ease those aches and pains that too many people put down to their mattress, rather than the lack of support from their pillow. This is a soft pillow, which may put off those who prefer firmer sleeping surfaces, and is not the best choice for those who sleep on their front. It shapes to you and your sleeping position and includes a removable, machine-washable cover. While it isn’t suited to those who sleep on their front, this pillow would be ideal for side and back sleepers kept awake by allergies. This pillow doesn’t offer as much support as others in the same price range, although those troubled by allergies may find the hypoallergenic nature of the pillow worth the price. Offering a plusher, cooler sleeping space, the Classic Brands pillow helps ease the discomfort of warm nights, giving you the chance to drift off into a cool, calm sleep. This is a thick, very firm pillow, which is worth bearing in mind when considering which memory foam pillow to purchase. If you’re more comfortable sleeping on softer pillows, the Classic Brands isn’t the pillow for you. As with most temperature regulating sleeping accessories, the pillow sadly doesn’t stay completely cool all night, but it should help with those uncomfortable first few hours on a warm night. This is a good purchase for those living in states where the nights can become uncomfortably warm. If you like a firm pillow, this is definitely for you. If you like a good, firm pillow, and would benefit from something to take the edge off of warmer nights, the Classic Brands is a reasonably priced pillow which could just meet your requirements. Finally, a pillow designed with front sleepers in mind! The Xtreme comforts is a thick, firm memory foam pillow that is ideal for those who sleep on their stomach. This is a pillow designed for those who sleep on their stomachs, who often find firmer pillows provide a better sleeping experience. Good for those who sleep on their stomach. If you’re a front sleeper who likes a firm pillow, this could suit your needs, at a reasonable price. 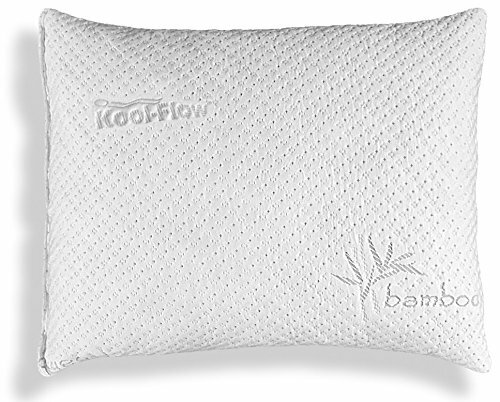 This is a very affordable, ventilated memory foam pillow, with a removable, washable cover. It is a very firm pillow, which is worth noting – if you prefer, or are used to, soft pillows, you may not find this one particularly comfortable. The Conforma is designed to offer contoured support to anyone, regardless of their dominant sleeping position. This is a general-purpose pillow that offers contoured support to anyone who likes a firm pillow, no matter their sleeping position. May be too firm for some peoples’ tastes. If you like a firm pillow, this is an excellent buy. The Coop pillow is a soft, deep-filled pillow which offers the ability to remove foam to create the most comfortable sleeping depth for you. It offers excellent back support and helps to relieve back pain caused by sleeping position. Best suited to those who sleep on their back or side, and who like a soft pillow, this pillow offers the advantage of being customizable – just remove as much foam as you like to perfectly tailor your night time comfort. May be too soft for some peoples’ preference and comfort.